What would be the perfect way to build a website? It would be a method that requires as little effort as possible, which results in optimal design and functionality. The website and its content would be produced in minutes by Artificial Intelligence with the ability to scour the internet and social media for more information than a human designer could ever even suffice to glance at in a lifetime. This isn’t science fiction or a far-fetched fantasy. 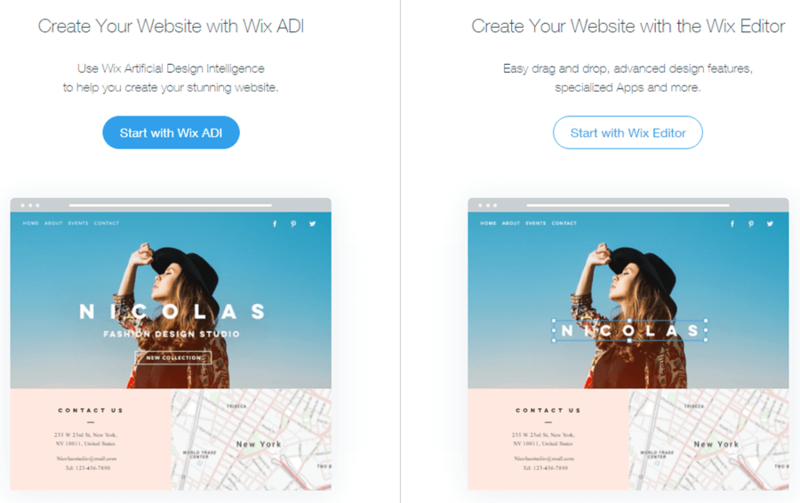 It’s website building platform Wix’s Artificial Design Intelligence, or ADI, and it’s already here. The idea behind Wix ADI is revolutionary. The Do-It-Yourself, drag-and-drop website editors offered by Wix and its competitors have already made designing a website much more accessible and easier than it used it be. However, they still require time, patience, and some computer literacy from the user. In fact, such DIY website builders are never as intuitive or simple to use as they are portrayed to be in advertisements. This is where Wix ADI comes in. It is truly intuitive, simple and requires absolutely no computer or design skill whatsoever. But does it deliver what it promises - a functional, entirely original and beautifully-designed website made with the help of an algorithm in mere minutes? We set out to try the product for ourselves and see what the resulting website and content it produced looked like. To sign up for Wix ADI, users need only provide their email and a password. Before starting to create your website, you can opt to view a selection of videos and step-by-step tutorials, or see examples of business and personal websites created by Wix users. The user is then prompted to choose which type of website they want to create from a list that includes business, designer, blog, online store, restaurants & food and photography. For our testing purposes we chose an online store, because it is the most complicated type of site that requires the most functionality. At this point, you are prompted to choose either ADI or the Wix drag-and-drop editor. It's interesting to note what Wix itself says about the difference between ADI and the standard Wix drag-and-drop editor. In fact, it gives some insight into the limitations of ADI: "While ADI is automated and easier to set up, the Editor has more customization options as well as more apps," Wix says in its Help Center. It adds: "Not all Wix and third-party apps are available in ADI." For those perturbed by this, Wix adds that you can always start in ADI and then move to the editor if you need to add the missing apps or require further customization. Once we've opted to start with ADI, Wix asks a series of questions, such as what do we intend to sell on our online store, do we need to take bookings and appointments or create a blog, and what is the name of our website or business. We decide to create an online clothing store, called ADI clothes shop. We choose not to fill in a physical address for our store, telling Wix that this is irrelevant. 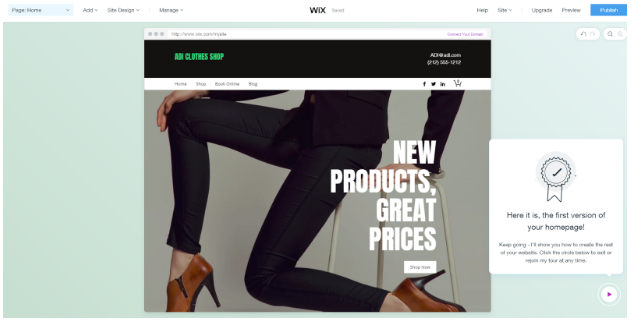 Wix also lets you decide which of your other store information you want to input, such as email, social media accounts, phone number, fax, as well as logo. ADI then formally introduces itself with the following message: "Hello. I am ADI, Wix's Artificial Design Intelligence. I was developed to guide you in creating a stunning website. I can create billions of combinations of text, images and more. Now that I've learned who you are, I'll use that information to design a website that's uniquely yours." ADI then interviews you about your style preferences, asking you to choose between a few different options. You can preview, not only your homepage, but your product pages, shopping cart, message that customers receive once they’ve made a purchase, and every other section and element of your site. 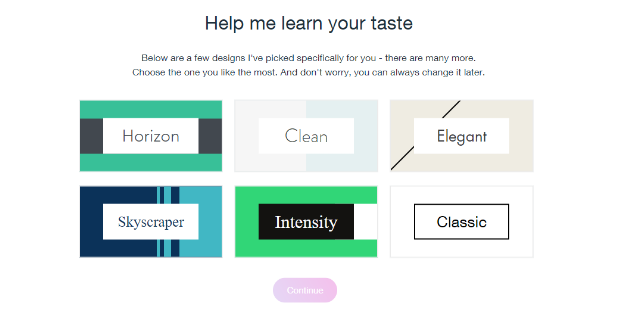 An easy-to-follow wizard takes you through the next steps, and asks you if you want to make changes to design, colors and fonts, cycling through choices until you find one that suits you. You can even choose to add your choice of cool animations to your site. ADI has also created content for us, some of which we can use as is, and some of which is placeholder text where the descriptions of our particular products will go. We can easily add products to the store by uploading images from our desktop, or dragging and dropping them into our site. We can also change description and price. With the click of a button we can add payment options to our site - credit cards, debit cards and PayPal. With ADI, we’ve successfully created an attractive website for our clothing store in minutes. Of course, we are responsible for taking pictures of our products and adding them to the site, which will take additional time. However, an amazing amount of the heavy lifting has been done in minutes by an algorithm. Now, we’ve designed our store and we are responsible for adding our products and adjusting our content and design as we see fit. ADI has done a pretty amazing job, so any edits will be minimal. For another type of website that is less complicated than an online store, such as a regular business site, or a portfolio site, ADI would have essentially done all of the work for us already. Incredibly, ADI does not cost users anything extra beyond Wix’s normal pricing plans. Wix has a free plan, but it’s mainly just a glorified free trial in which you can play around with ADI and the drag-and-drop editor. It doesn’t allow you to use your own domain, which is crucial to a website. There are, however, 5 paid plans to choose from, all of which allow you to build a site with either ADI, the classic drag-and-drop editor, or both. There is a connect domain plan, for those who already have a domain, which gives you minimal functionality and will feature Wix ads on your site for $9.08/month; a combo deal, that includes a free domain and removes the Wix ads for $14.92 month; an unlimited plan, which allows greater functionality and some marketing capabilities, such as email campaigns for $19.92 per month; the Ecommerce plan, which we would have used for our online store, for $26.25 per month; and the VIP plan, which includes Wix business solutions for more advanced online stores, restaurants and hotels. The pricing on these plans is subject to change occasionally and Wix often runs promotions in which they can be attained cheaper. The point is, ADI, which saves users a great deal of time and energy, doesn’t cost a penny more. For our fictitious online store, we may indeed opt at the end of the day to switch to the traditional drag-and-drop editor to enjoy the full complement of apps in Wix’s app marketplace. However, ADI did not let us down, doing the bulk of our design work, and some of our content work for us. The future is truly here with Wix ADI. As promised, it created a stunning, entirely original website for us in just a matter of minutes, after having asked just a few simple questions. For those procrastinating about building the website they’ve always wanted, there are no more excuses. Wix ADI has truly made website building accessible to everyone.